When equipment comes into contact with power lines, although workers are not always injured, the danger and costs are often great. In the picture at right, a boom truck made contact with a 7,200-volt distribution line and the line did not trip out. The current flowed to the ground through the truck, which caught fire and was completely destroyed. This resulted in the loss of equipment worth hundreds of thousands of dollars, and could have resulted in loss of life as well. Another incident that resulted in considerable equipment damage involved a piece of forestry machinery, when the boom of a delimber came into contact with a 69,000-volt power line on a private woodlands road. The owner/worker of a small mechanical logging company had completed his cutting operations in one block of forestry land and was moving his machinery to another block. It was late in the day and visibility was poor, as it was getting dark. 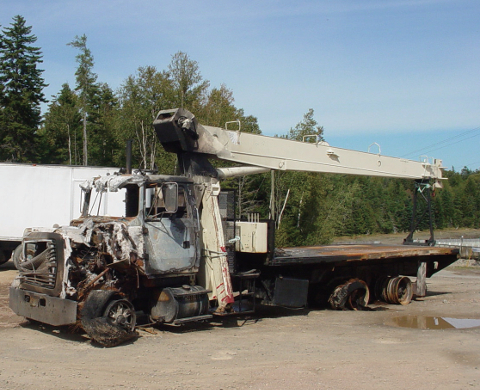 The operator loaded the delimber onto the trailer but had not placed the boom in the transport position. As he moved down the road, the boom came into contact with power lines, pulling down three power lines and breaking off the poles. As a result, two sawmills and an entire town were without power for a number of hours. Miraculously, no human injuries were sustained. When moving equipment, always place it in the proper transportation position according to manufacturer’s specifications, regardless of the distance to be traveled. Build roads in such a way that they avoid crossing under power lines. Place reflective signs at any area where lines cross a roadway. Drivers and operators need to be aware of the location of all power lines. Remember that in warm weather, there is greater sag in power lines, so clearance is decreased. Also, be particularly attentive where roads have been built-up, as the distance to the lines will also be decreased. For more information on power safety, click "Contractors' Safety" under the "Safety and Learning" tab at www.nbpower.com.